Sheringham mainline railway station in 1978. Todays main line station at Sheringham is on the other side of the road to the North Norfolk's Railways station. The mainline station is on the single track line from Cromer and Norwich. There is just a very short platform with a buffer stop at Sheringham. This station was built when the station and the railway line to Holt that the North Norfolk Railway now uses was closed. This meant that the level crossing over the main road into the town could also be closed. Just a short platform for a two car DMU was built at the new Sheringham station. There is a very small car park with space for about two taxis. Being set back from the road many people could miss this station. The North Norfolk Railway then took over the closed Midland and Great Northern Joint line station across the road. For many years the NNR tried to get the level crossing reinstated across the road. Plans for mainline trains to share the NNRs station came to nothing. A normal level crossing with gates was ruled out, but a part time line across the road to give access to and from the NNR for main line trains on just a few days a year was at last passed. The new Sheringham Crossing was re-opened on Thursday the 11th of March in 2010. Pete Waterman and hundreds of people saw 70013 a Britannia class locomotive named Oliver Cromwell cross over the road with a mainline steam trip. This was the the first passenger train over the road for forty six years. 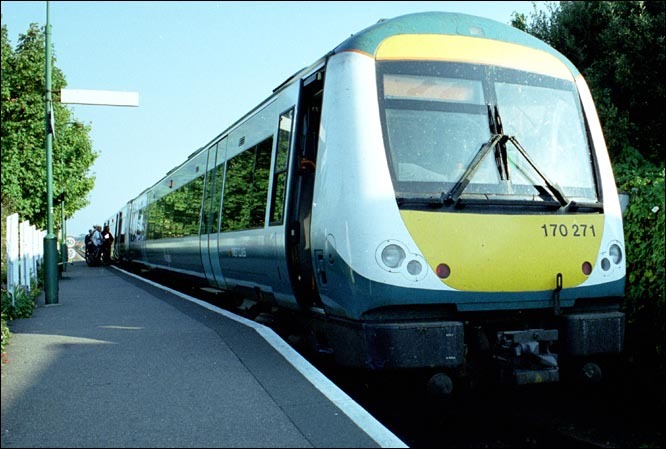 Anglia class 170 271 at Sheringham mainline station in 2003. These Class 170s are not now used on these services most of the time, class156s are used the most.